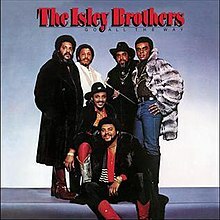 Go All the Way is the eighteenth album released by The Isley Brothers for their T-Neck imprint in April 19, 1980. The album was remastered and expanded for inclusion in the 2015 released CD box set The RCA Victor & T-Neck Album Masters, 1959-1983. The album is notable for the Billboard Top 40 and Billboard #1 R&B ballad, "Don't Say Goodnight (It's Time For Love)", and the number 11 mid-tempo hit "Here We Go Again". All tracks written by Ernie Isley, Marvin Isley, Chris Jasper, Rudolph Isley, O'Kelly Isley and Ronald Isley. 2Pac sampled "Don't Say Goodnight (It's Time for Love)" on his song "My Block" for The Show soundtrack in 1995. Will Smith sampled "Here We Go Again" on his song "Yes Yes Y'All" on his album Big Willie Style in 1997. J Dilla sampled "Don't Say Goodnight (It's Time for Love)" on his song "Bye" on his album Donuts in 2006. J Dilla sampled "Don't Say Goodnight (It's Time for Love)" on his song "So Far To Go" on his album The Shining in 2006. UGK sampled "Here We Go Again" in their song "The Pimp & The Bun" featuring Ron Isley on their album UGK 4 Life in 2009. ^ Wynn, Ron. The Isley Brothers: Go All The Way > Review at AllMusic. Retrieved 03 September 2011. ^ Christgau, Robert (1981). "Consumer Guide '70s: I". Christgau's Record Guide: Rock Albums of the Seventies. Ticknor & Fields. ISBN 089919026X. Retrieved February 27, 2019 – via robertchristgau.com. ^ Hillier, Bev. "The Isley Brothers: Go All the Way". Smash Hits (May 15–28 1980): 31. ^ a b "The Isley Brothers US albums chart history". allmusic.com. Retrieved 2011-09-03. ^ "The Isley Brothers US singles chart history". allmusic.com. Retrieved 2011-09-03. This page was last edited on 27 February 2019, at 22:51 (UTC).